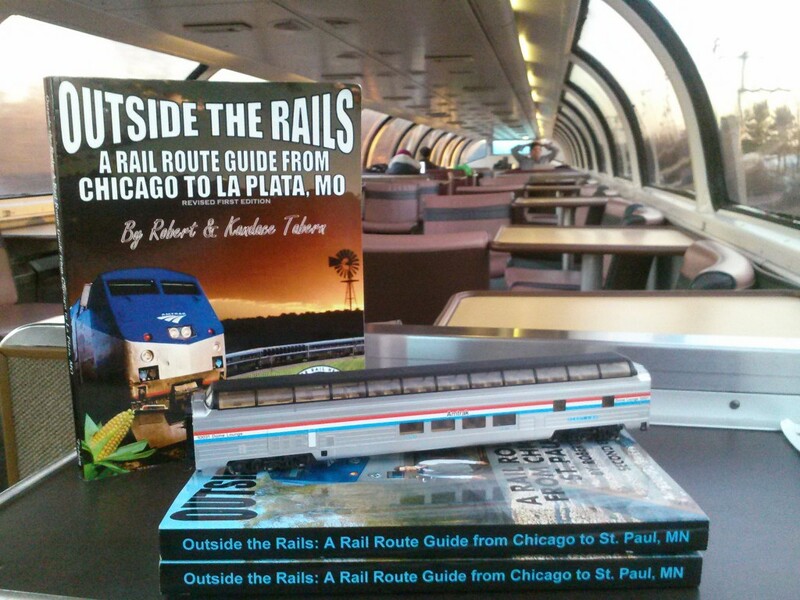 Many people in the Chicagoland area and in La Plata, Missouri know that a Trails & Rails program has been operating on the Southwest Chief for the past few years now. The program was founded on December 3, 2012, and began operations in mid-May 2013 with a group of 30 Chicago-based volunteers. Trails & Rails returns on the route for a third year in just a few weeks from now, starting on May 12, 2015. Trails & Rails is a partnership between Amtrak and the National Park Service. Our group is also sponsored locally by Texas A&M’s Department of Recreation, Parks, and Tourism Sciences; the institute of higher education, and in particular lecturer Susan Scott, has provided key educational and editorial support for the group. We are also sponsored by the non-profit American Passenger Rail Heritage Foundation (APRHF). 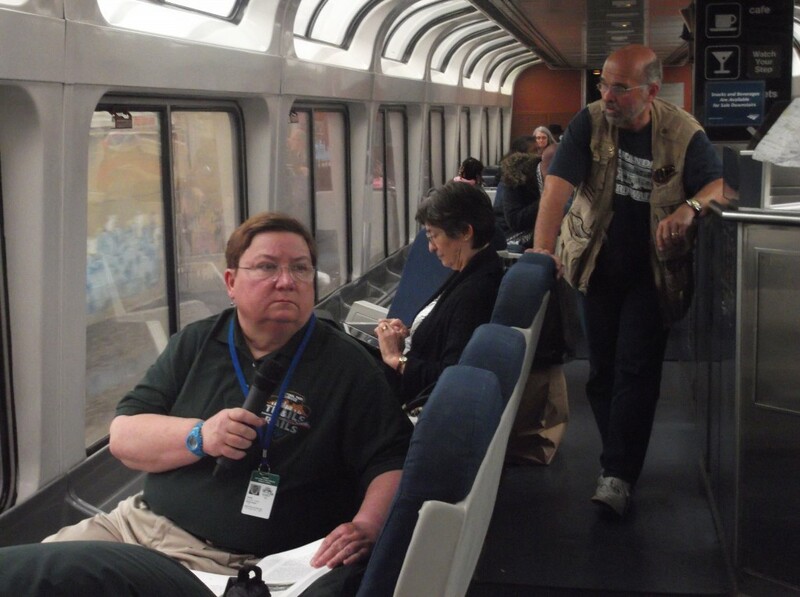 The APRHF handles day-to-day operations of the program in the western terminus of La Plata, Missouri; they also have provided funding to ensure volunteers have a wireless speaker system and have their lodging needs met during their layover between the westbound and eastbound trains. A lot of people will turn out at this event to see and purchase various railroad memorabilia that will be on display. So, why not stop by and say hello to Trails & Rails and learn more about our program? Join Trails & Rails volunteers JOHN KELLY and ROBERT NEIL. We will be taking e-mail addresses and names down for people who would like to be interviewed as a prospective trainee for the 2016 season. John, who is a well-known railroad author, jointed Trails & Rails in 2007 and wrote several articles for TRAINS Magazine about his experiences as a docent. He will be going on his third year with the program on the Southwest Chief. Volunteer Robert Neil works as a professional clown; he wasn’t “clowning around” when he decided to join Trails & Rails in 2014; he has become one of our best and most personable docents. The APRHF will also have a separate booth at this event with La Plata brochures and items/books/railroad route guides for sale. For the past seven years, Amtrak has held National Train Day celebrations all across the United States. Starting this year, they decided to focus on one particular city and hold a special train-related event, which will be entitled “Amtrak Train Days”. This new generation of celebrations will kick off in Chicago on Sunday, May 9, 2015, with the premier Amtrak Train Day. There will be a lot going on — including “hard hat” tours of Chicago Union Station, an excursion train to the Chicago Yards, and a special evening train ride out to Three Oak, Michigan and back. Between 9:30am and 3:30pm, make sure you stop off in the Great Hall and visit the Trails & Rails booth. Docents from both Chicago-based programs will be in attendance; learn more about our route on the Southwest Chief between Chicago and La Plata… and about our sister Trails & Rails program on Amtrak’s Wolverine and Blue Water trains, sponsored by Indiana Dunes National Lakeshore. Southwest Chief Trails & Rails volunteers ROBERT DIRKS, FRED GLURE, FRANK MAXWELL, RUTH MAXWELL, ROBERT NEIL, and DAVE POOLE will be in attendance. Also note that the APRHF will have a separate booth that will feature brochures and memberships… make sure you stop by and visit with famous “Kansas City Nathan”, host of the popular “Let’s Talk Trains Show”. Due to Amtrak restrictions, nothing will be for sale at the APRHF booth at Amtrak Train Days in Chicago. We will be taking names and e-mail addresses at this event for people who would like to participate in an interview to become a possible new trainee in 2016. One of the biggest railroad events of the summer takes places every year on the fourth weekend of June in Galesburg, Illinois. Of course, we are talking about the Galesburg Railroad Days! There is something for just about everyone there — from a small carnival to bus tours of the BNSF yards to a toy and train show. This year’s Galesburg Railroad Days event will also be an official Amtrak Train Day stop and will feature Amtrak’s Exhibit Train. Be sure to make it over to Carl Sandburg College from 9AM to 4PM on Saturday… or from 10AM to 3PM on Sunday… and spend some time with Trails & Rails volunteers ROGER DART, ROBERT NEIL, and ROBERT DIRKS. They will tell some Galesburg tales that are told to passengers when aboard the Trails & Rails program on the Southwest Chief. We will be taking names and e-mail addresses at this event for people who would like to participate in an interview to become a possible new trainee in 2016. The APRHF will also have its own table at this event too where books, railroad route guides, and other items will be for sale. So, whether it’s Glen Ellyn, Chicago, or Galesburg — we hope to see you OFF the train in 2015… as well as ON the train for our regular programs. More outreach events will be announced here soon. “Outside the Rails” Route Guides will be for sale at the APRHF booth at events planned in Glen Ellyn and Galesburg, IL; you can also purchase these rail route guide books by visiting: www.silverrailsshop.com or www.outsidetherails.com.